Keto Taco Stuffed Mini Peppers are low carb, gluten free, grain free with a paleo option. 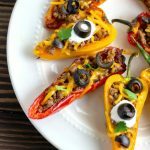 Mini bell peppers stuffed with taco seasoned ground beef and topped with optional cheese, olives, sour cream or paleo sour cream. Preheat oven to 350°F and line a large baking sheet with aluminum foil. Slice each pepper lengthwise Remove seeds from peppers. In a 10-inch skillet, cook beef over medium-high 5 to 7 minutes, stirring occasionally, until beef is browned. Drain beef and return to the skillet. Stir in taco seasoning mix, tomato sauce, and water. Cook over medium heat 5 to 10 minutes, stirring occasionally. Fill each pepper with beef mixture and place on the prepared baking sheet. Bake 13 to 15 minutes. Remove peppers from oven. Sprinkle with optional cheese and sliced olives and return to oven for 1 to 2 minutes, until the cheese is melted. Remove from oven. Top each with a teaspoon of optional sour cream and serve.